Logic-Pharma is a vertical specific ERP for Pharmaceutical industry devised to solve business challenges optimally and to make operations more profitable. The software help clients operate effectively and efficiently in the complex pharma industry where high number of competitors, strict compliance mandates, and complex product mix increase worries for business planners. In addition, perishable inventories, large spread networks, and fluctuating demands, propels a high need to incorporate advanced technologies, to strategize processes to meet time-bound market pressures. Reliable lot and tracking solution. Effective batch sizing and scaling. Batch wise rate and stock. Batch wise expiry and allots. Barcoding of products as per OEM, as well as 2D concept. Tracking of damage stock and return. MR wise doctor visit records. Party wise payments terms settings. Probation for customer wise product pricing. Party wise credit limit, bill limit. Billing law process. Multiple packaging concepts, box, dozens, strip, etc. Multiple unit term measurement, tablets, bottle, strips, pcs. Substituent products, concepts as per WHO policy. Composition capture facility. Narcotics/antibiotic product selling, with respect to doctor prescription for retail, drops billing, handling. For retail, billing reference to doctor prescription. Doctors detail capturing, as well as patients Prescription reminder for retail billing. Prescription and OTC medications and custom features. POS Touch Screen is enabled to reduce the amount of time required to train new cashiers, saving you costly payroll. LOGIC Pharma "Easy Read" Customer Display is designed to allow the customer to clearly see items being scanned. No clutter—Big Bold Print. Improves customer relations and store integrity. May be installed remotely anywhere on the grocery check stand for maximum visibility. Though Layaway is integrated, multiple payment modes like cash, credit card, credit note, meals voucher even if cheque and cash card provide flexibility to grocers / supermarket owners for their collection. When goods are received into inventory, a barcode label must be applied to each item before it can be distributed to stores. In order to save valuable time when receiving the goods and avoid distribution delays, you can run a simple program well before the goods are received, which sends the correct amount of labels for each Item directly to a label work area, according to the itemized vendor invoices linked to a given shipping voucher. Using the electronic data interchange (EDI) module, you can maintain a continuous dialogue with branches of a chain store. The module enables you to manage separate part numbers and packing units for your own company and for the chain branches. This module supports optimization of the three basic operations of warehouse management: Directed Picking Directed Replenishment Directed Putaway These are all subject to constraints defined in advance by the warehouse manager. You can also use this module to plan other routine warehouse tasks, such as inventory count, return to vendor, warehouse transfer, etc. For each warehouse operation recorded in this module, an appropriate inventory transaction document (e.g., shipping, sales invoice, or warehouse transfer document) is created, using built-in programs. The module interfaces with automated data collection (ADC) systems, and supports input of inventory data via handheld devices and other data collection tools. The bonus system in LOGIC ERP enables you to offer customers bonus Items when they order a certain quantity of a specific Products or Items belonging to the same Item family. There are two types of bonuses: Regular bonuses are given upon purchase of a certain Item by some or all customers. Special bonuses are defined for specific customers and are given to those customers only. You can define progressive bonuses based on quantity purchased, so as to increase the customers' incentive to purchase large quantities. Field/Sales Agents: Receiving Orders & Reporting Customer Returns Using Handheld Devices. 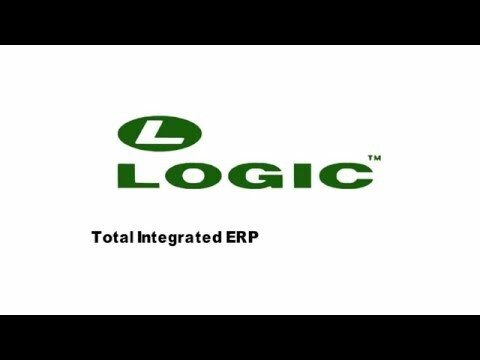 LOGIC ERP's POS utility is designed for working online or offline, to pass information back and forth regarding sales orders and customer returns. The module provides sales reps with up-to-date details regarding Items a customer is interested in, unpaid bills, and more. Planning and Execution of Delivery Scheduling to Chain Store Branches Using a Fleet of Vehicles. LOGIC ERP's Delivery Scheduling module enables you to Set up distribution routes and arrange order delivery by date and route. Manage a fleet of vehicles, defining weight and volume capacity. Automatically assign vehicles by date and distribution route, controlling for weight/volume limitations. Prepare order pick lists according to distribution route. Produce sales invoices and shipping documents per distribution route. Narcotics/antibiotic product selling, with respect to doctor prescription for retail, drops billing, handling. For retail, billing reference to doctor prescription. Doctors detail capturing, as well as patients. Prescription reminder - for retail billing. Prescription and OTC medications and custom features. Multiple packaging concepts; box; dozens; strip; etc. Per User Addidtional Charge for every user. Q. Can it handle Multiple-Branches, Multiple-Stores and multi locations? Yes, our ERP software provides a great flexibility that you can use it for your multiple-Branches, multiple-stores and multi locations easily.